During the Elizabethan era china was regarded as a luxury reserved for royalty and some members of the upper class. 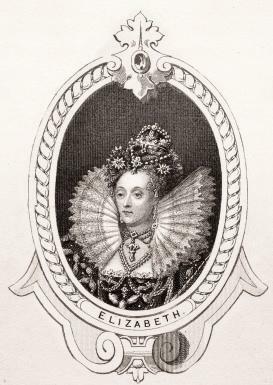 The reign of Queen Elizabeth the First, from 1558 - 1603, is known as the Elizabethan era. During this time the English Renaissance was at its peak as the arts and culture flourished. Also known as the Golden Age of England, there were vast differences between the classes that divided the people of the time. This class division was even seen in the eating utensils used by the different classes. Meals served in the homes of the poor lower class consisted of a simple breakfast, the main meal of the day which was dinner at noon and a light supper eaten at 7 or 8 at night. Their meals were served on vessels of wood or pewter. The meals of the rich were very different. The day started with a light snack for breakfast, dinner was a large elaborate meal that lasted three hours or more and was followed by a smaller supper around 6 in the evening. They ate their meals from silver, delft from Holland and glass. There were also vessels made of pottery, known as Coarse Sandy Ware. These pieces were generally brown or green with a plain simple lead glaze. The Elizabethan people still had not seen the fine porcelain wares produced in China. In 1557 the Portuguese established a trading post on the island of Macao. From there the first pieces of porcelain from China were taken to Europe and England where it was immediately appreciated. It was quickly realized that these products were much finer then any of the European pottery that existed and was often referred to as white gold. The pieces were called china-ware which eventually became shortened to china, the name which is interchangeable and acceptable for porcelain regardless of where it is made. Throughout Europe craftsmen tried to create pieces like the fine porcelain from China. For the most part, their attempts were unsuccessful until the 1570s when good quality porcelain was produced by the Medici court of Florence, Italy. Extremely rare and exquisitely beautiful are pieces with Chinese porcelain mounted in wonderful Elizabethan silver gilt work. These precious pieces are highly coveted by collectors who dream of adding them to their collections. Many of the surviving pieces from the Elizabethan era are housed in museums, although there are also pieces in private collections. One of the largest private collections of these magnificent antiques belonged to J.P. Morgan and was acquired by the Metropolitan Museum of Art from his estate after his death. A magnificent example from Mr. Morgan's collection is an ewer from the Wanli period of China dating from 1585. The porcelain of this spectacular blue and white ewer is mounted in intricate and delicate silver gilt work done by a London silversmith. Many fine examples of china used during the Elizabethan era have been found in various places in England including Exeter, Berry Pomeroy Castle and Plymouth. The finest preserved pieces are from Exeter and were found in 1974 during the construction of the Guildhall Shopping Center. The large fragments are from the Ming dynasty, dating from circa 1600. The hard paste porcelain remnants of a dish and saucer-dish are both painted in an underglaze of beautiful shades of cobalt blue. The dish shows a peaceful scene of fishermen on islands with trees and rocks. The dish has a peach-colored border with flowers symbolizing immortality. The scene on the saucer-dish is a bird standing on a rock. Two other beautiful examples of Ming china from Elizabethan England were found in a stone lined pit during the construction of the same shopping center in 1972-3. A cup and saucer-dish both painted in underglaze shades of cobalt blue are also among the finest pieces of Elizabethan china ever recovered in England. The saucer shows a popular scene of Chinese porcelain which can be dated to 1585-1600. The scene is of a bird under a pine tree with two prancing deer. The cup is simply decorated with lines and dates from the early1600s. Existing pieces of Elizabethan era china show the advanced development of Chinese porcelain with its beautiful workmanship. The pieces are delicate yet strong and when mounted in intricately detailed Elizabethan silver gilt work, exemplify the beauty of the times.